23 « March « 2016 « Nothing in Biology Makes Sense! As the fifth episode of Planet Earth begins, it feels like you might have stepped onto another planet. Desert landscapes have an alien, otherworldly feel to them; vast swaths of sand around the world have acted as the backdrop for NASA equipment tests, science fiction classics like 2001: A Space Odyssey, and, of course, supposed extraterrestrial activity. But despite their interstellar associations, deserts are very much of this planet. As narrator David Attenborough tells us, deserts cover a third of the Earth’s surface, and all of them are populated with life. “Deserts” takes us into a world of extremes, where the environment can go from habitable to hostile in an instant. In this 10-year anniversary post we will relive the episode’s most intense moments, highlighting the incredible challenges that accompany life in Earth’s driest places. We will also take a look at the unique difficulties conservationists face in attempting to protect the organisms that inhabit these inhospitable regions. In the deserts of our planet, extremes are the norm. Attenborough tells us that temperatures fluctuate annually in the Gobi Desert from -40° C in the winter to 50° C in the summer. Death Valley holds the record for highest temperature ever recorded, at 56.7° C. In the Sahara Desert, sandstorms to rival Mad Max can reduce visibility over regions the size of Great Britain for several days, and the resulting dust clouds can affect weather patterns around the world. Things don’t happen in moderation here. Good conditions are transient, and when they do occur, organisms must be ready to take full advantage of them. Timing is everything when you are trying to survive in the desert, a fact that is apparent in multiple segments of the “Deserts” episode. Kangaroos in Australia forage in the early morning when temperatures are moderate, but must find a tree that provides suitable shade from the sun before midday, lest they risk overheating. Scorpions and toads in the Sahara have almost no tolerance for the sun’s rays, and must emerge from shelter only at night. The importance of timing shows up in somewhat unexpected ways as well. For example, wild camels have fine-tuned the timing of their breeding season to coincide with the onset of winter, when precipitation is the most abundant. In the Gobi Desert, snow covers the ground throughout the winter months, providing a reliable and widespread source of water for the camels. Planet Earth camera crews searched the Gobi for two months for these rare and elusive animals, finally obtaining fantastic footage of the bizarre mating rituals of the species. The ephemeral nature of favorable conditions means that a single bout of resource availability must sustain desert plants and animals for long periods of time. In Namibia, a flash flood (one of just a handful that occur annually) produces a burst of vegetation growth. This rare resource attracts oryx to area, which in turn attract a family of lions. Attenborough tells us that a single oryx will sustain the entire lion family for a week. These infrequent bouts of productivity are key in maintaining life here, for a range of species. Rain is also infrequent in the Sonoran Desert. Consequently, the saguaro cactus is well-adapted to make the most of the brief Arizona monsoon season. The pleats on its trunk allow the cactus to expand, so that it can absorb as much of this valuable resource as possible- up to 5 tons! And if the cactus is good at collecting water, it’s even better at making it last; it can live off these stores through multiple months of drought. When resources like water are so difficult to come by, one survival strategy utilized by many desert species is to rely on other organisms collect them first. In the Atacama, the only predictable source of water comes in the form of a fog generated by cold ocean currents. Coastal communities of plants called lomas collect the fog’s moisture, and provide life-sustaining hydration for a number of desert organisms. Guanacos eat cactus flowers for the water they contain, and coyotes lick dew off of moisture-loving lichens. Interacting with other species can also be key if you are a traveler, trying to get across the depauperate desert environment as quickly as possible. 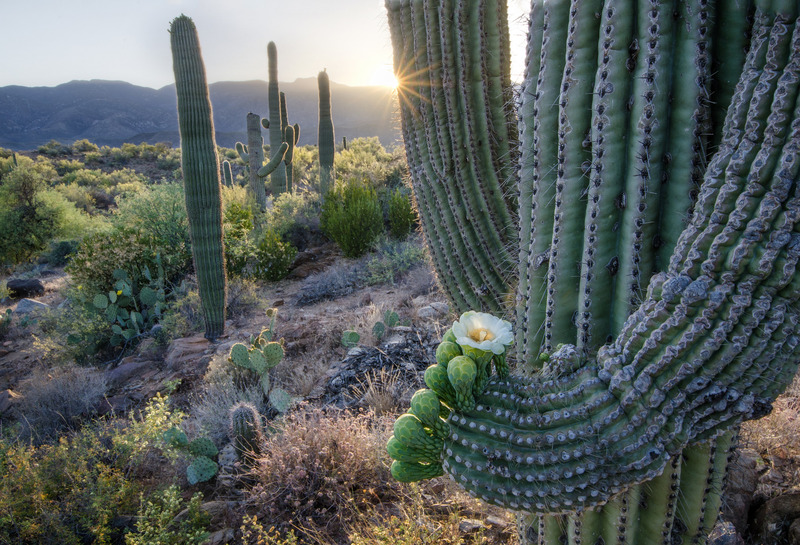 For just four weeks during the summer, saguaro cacti bloom during the night. The timing of this event corresponds to the annual migration of the lesser long nosed bat. As bats travel across the Sonoran during their trip from Mexico to the United States, they subsist on nectar from the flowers, fertilizing the next generation of cacti along the way. The bats would have no hope of making it across if it wasn’t for this short-lived food source, and the saguaros in turn rely the bats for pollination. While resources are fleeting in the desert, we learn that some elements of this ecosystem stick around for a surprisingly long time. 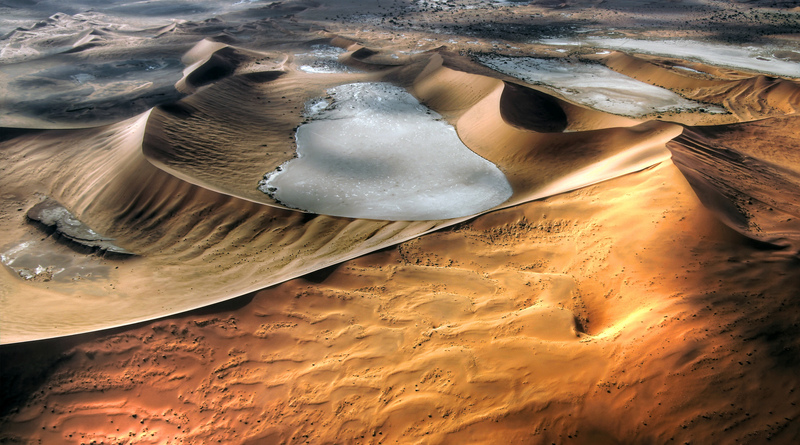 For instance, star dunes in Namibia can reach up to 300 meters high. The sand at the peaks of these dunes is in almost constant motion thanks to the wind, but sand at the base may not have shifted for 5,000 years. In addition, locust eggs lie dormant for 20 years before they hatch, and seeds in Death Valley can wait for 30 years for favorable conditions before they sprout. A “superbloom” of wildflowers is currently taking place in Death Valley- what a fantastic way to celebrate the anniversary of Planet Earth! In the desert ecosystem, organisms face a somewhat bizarre set of conservation challenges. From the illicit underground cactus trade, to the legacy of nuclear weapons testing; from rabbits run amok in Australia, to the controversially brutal hemorrhagic disease released to control them; from a history of violent confrontations between the federal government and armed ranchers, to the endangered desert tortoise that first set those land disputes in motion- conservation in the desert has a strange and dramatic past. In terms of scale, The Great Green Wall of Africa is as dramatic as conservation comes. An effort to counteract the ongoing effects of desertification, the Great Green Wall project proposes to plant a corridor of drought resistant trees along the southern edge of the Sahara. The Great Green Wall, if completed, will be really, really long: 4,750 mile long and 9 miles wide, to be exact. It’s a huge undertaking, with 12 nations currently in collaboration on the project. But if all goes to plan, the Great Green Wall will be quite an amazing feat of conservation. Big game hunting presents another dramatic desert conservation issue. 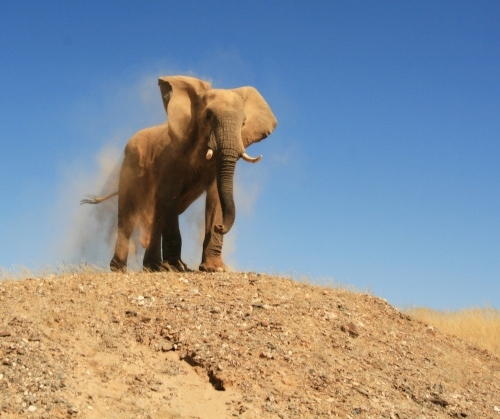 In 2014, Namibia issued a handful of licenses to hunt desert elephants. Desert elephants are distinct from African elephants, exhibiting a number of behavioral and morphological adaptations for desert life. These locally adapted animals are also exceedingly rare, with fewer than 100 individuals in Namibia. However, desert and African elephants are not technically considered separate species, and thus the Namibian government does not currently extend any additional protection to these populations. This controversy highlights the importance of species delimitation in conservation- an issue that is only more dramatic in the context of big game hunting. The plants and animals of the desert are some of the planet’s most hardy, but even they can have difficulty rebounding from disturbance. In the Atacama, the life-sustaining lomas are at risk. Local people rely on the water-collecting capabilities of these plants for survival, but have also destroyed the majority of the vegetation to make way for agriculture. Researchers are attempting to replant one particular plant, called the tara tree, in hopes that it will help to rehabilitate these important communities. But new seedlings seem to have trouble taking hold within existing lomas. Lomas are home to 1,400 plant species, around half of which are endemic; their loss would be truly devastating to the region. Deserts, with their reputation as barren wastelands, may not seem like obvious targets of conservation. Desert flora and fauna face extreme conditions on an everyday basis, and the added strain of human impacts makes survival all the more difficult for these organisms. But on the bright side, evidence suggests that our effects on deserts can be successfully mitigated. In the case of the once-threatened Eureka dune grass, limiting the use of off-road vehicles in particular regions of Death Valley has been enough to allow populations of the plant to reestablish. Life in this unique desert ecosystem defies all odds, and protective measures will be key for helping it to persist into the future. Be sure to stick with us as we continue our celebration of Planet Earth’s 10-year anniversary! Check out our posts on “From Pole to Pole,” “Mountains,” “Fresh Water,” and “Caves.” Next week we’ll be looking at the polar opposite of deserts: ice worlds!